November 25, 2010 - Happy Thanksgiving! Right on que, the trout have made their beds. 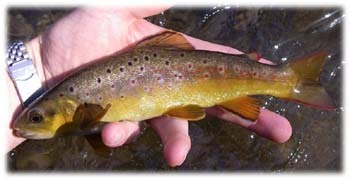 Each year, Veteran's Day is the go to date for redds to show up on your favorite wild trout stream here in SE PA. If you know what you are looking for, they stick out like a sore thumb. Look for brite colored gravel generally in the shape of an elongated circle toward the tail out of a pool. Water can range in depth from just a few inches to a few feet, but normally depth is less than a foot on our small water streams. So when you are out and about in the near future keep an eye out, and a wide berth. We are talking our future catches here. Recent outings to the SE PA limestoners have been producing quite a few fish. They are looking up, taking drys as well as taking subsurface patterns like the nitro and the ultimate. Judging by the colors of the fish they are also getting close to finding a mate and doing what they like to do each and every fall. Generally right around Veteran's Day is high time for the spawn. So keep an eye out when traipsing around your favorite wild trout water. Or better yet, just leave them be for the time being.